Herewith another variation for a crunchy, healthy morning muesli to enjoy with a little natural yogurt. This one is sweetened with honey and brown sugar. This is a large recipe and you will need two baking trays, it makes about 1.6 kilo’s (about 3 pounds). That should last you a whole month. Feel free to cut it in half if you think its going to be too much. 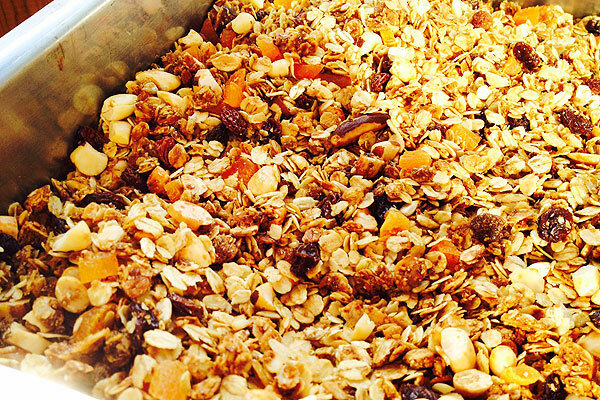 Making muesli takes a little time because of the time it takes to bake in the oven. So its a good recipe to do in the evening while watching TV. As I said in my other muesli recipe, making your own will not save you any money. Nuts and seeds can get expensive. The beauty of making your own is that you can control the ingredients. If you want a completely organic product its very easy to achieve. You can also see Muesli with Maple Syrup and Dried Cranberry’s. It doesn't take much time to put this together, its the baking that takes the time. What can go into a good muesli is really up to you. This one contains a lot of nuts and seeds and a few tablespoons of this on a little natural yogurt makes a very satisfying start to the day. Prepare all the dry ingredients including the salt, and brown sugar and combine them well in a large bowl. Pour in the oil and honey and mix well. Pour the mixture into 2 roasting trays. They need to be of a good size. Place one of them into the oven and bake for 40 minutes, turning the mixture every 20 minutes. After 40 minutes add the raisins and dried apricots, mix in well and return to the oven for 10 more minutes. When done remove from the oven and pour the mixture onto some baking paper to cool. Repeat the baking process with the second tray, mixing every 20 minutes and then adding the dried fruits. Bake for 10 more minutes. Cool in the same manner as the first. You can run into problems with this recipe and once and a great while I have burned it and had to throw it all way. Since some of the ingredients are so expensive, it's really important to know your oven. Mine is a real horror story and I hate it but have learned a couple of tricks that help. If you have a convection oven with a fan use it. It will help toast the mix evenly, but it will take a little less time to make the muesli so keep an eye on it. If you don't have a convection oven and it came with a roasting pan DON'T use it. They usually block the heat from raising over and around the pan. In my oven it can be 250 degrees under it and 100 over it. That's when you burn it. Use a pan that gives you a few centimeters/inches all the way around the pan so the heat will rise and fill the oven evenly. A little note about linseed's, its best to buy them already crushed. Your body will not be able to extract all the good oils from the seeds when digested whole. Crushed linseed is readily available in most supermarkets. Almond skins have a bitter flavor its important to remove the skins or buy them already skinned. Brazil nuts can be quite soft and the best way of chopping them is with a knife. A mini food processor will chop them too small or will turn it into Brazil nut butter. I prefer to cut all my nuts using a chefs knife. I eat this about 4 mornings each week sprinkled over a little natural yogurt. I store mine in large mason jars but any air tight container works well. This will keep about 6 weeks in a cool, dark, dry cabinet. 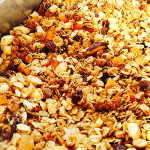 This is a wonderful recipe and its surprising that Muesli can be so good. It would make a great gift to take to a friends. It will truly make you look forward to breakfast that's for sure.